Eighty-one percent of Americans either own or are interested in purchasing a connected home product in the next year. To Americans, the main benefit of having a connected home product is increased convenience (54 percent), followed by increased security (44 percent), a reduced energy bill (38 percent) and boosted home value (21 percent). Thirty-eight percent of Americans are more interested in connected home products today than they were six months ago. The increased interest is also reflected in the retail environment. The average connected consumer is family- and home-oriented. An overwhelming 89 percent said spending time with family is their first priority, yet approximately half (51 percent) rarely have enough time in the day to do all they need. Perhaps that’s why 63 percent wish that their home could just take care of itself. Fifty-six percent feel it’s more important that their home is comfortable than looks good, and 73 percent love their home and want to live in it for a long time. Increased safety and security continue to be compelling reasons to integrate connected home technology with 44 percent of Americans indicating this as a key benefit of having connected products. Fifty-four percent value the convenience they offer, such as the ability to monitor and control their home from anywhere. Reducing monthly bills and environmental benefits are also key motivators for consumers to install connected home products, with 38 percent pointing to reduction in home energy bills as a benefit of connected home products. Fifty-nine percent of Americans also indicated they worry about their energy consumption. Despite growing awareness of connected home products like thermostats, Americans are concerned about keeping their personal information secure online (82 percent) and worry that the technology in their home will quickly become outdated (43 percent). Understandably, they are willing to pay extra for high quality electronics in their homes (63 percent). Americans just want the technology in their home to work well together (86 percent). When it comes to specific products in the home, Nest is gaining brand awareness in comparison to long-established thermostat companies. Asked which thermostats for the home come to mind, a growing number of Americans are naming Nest over established brands. 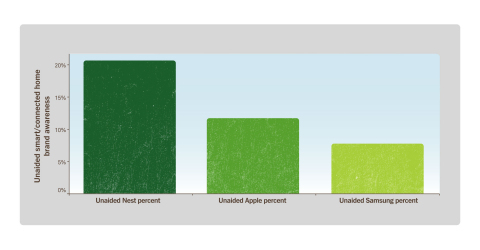 Nest Thermostat unaided awareness grew from 6 percent in 2013 to 26 percent in 2016. Awareness of connected home brands gradually increases with household income levels. However, across multiple income levels, more than half of Americans can name at least one connected home brand. When asked which brands in the “connected or smart home” space came to mind, 21 percent named Nest as the top brand, while Apple takes second place with 12 percent of mentions and Samsung follows with 8 percent of mentions. The Kelton Global/Nest Connected Home Survey was fielded between April 18, 2016 to April 20, 2016 among 1,018 nationally representative Americans ages 18 and older. Quotas were set to ensure a reliable representation of the U.S. population 18 and older. Conducted by Kelton Global, the connected home survey investigated consumers' interest in smart home products and their perceived benefits and concerns. The margin of error for this study is plus or minus 3.1 percentage points. *Additionally, Kelton Global conducted seven studies of home electronic brand and product awareness from August 5, 2013 to January 5, 2016, with 500 to 1000 responses per study consisting of Americans ages 25 to 65. All survey participants are homeowners, decision-makers in their household about energy, own smartphones, have a household income of $60,000 or more, and are engaged with technology. The margin of error for these studies ranged from plus or minus 2.0 to 3.4 percentage points. The Research Now/Nest Connected Home Survey was fielded between January 22, 2016 to January 25, 2016 among 614 geographically-representative U.S. homeowners, aged 25 to 65, who are decision-makers in their household about technology and have a household income of $60,000 or more. Fielded by Research Now, the survey investigated consumers' interest in smart home products and their perceived benefits and concerns. The margin of error for this study is plus or minus 3.9 percentage points. Kelton Global is a research, strategy and design consultancy that works with many of the world's largest and most recognizable brands to help them better understand and connect with consumers. Kelton Global integrates research with strategy, design, and communications for immediate business impact. For more information, please visit www.keltonglobal.com. Research Now Group, Inc., is the global leader in digital data collection to power analytics and insights. It enables data-driven decision making for its 3,000 market research, consulting, media, and corporate clients through its permission-based access to millions of deeply-profiled consumers using online, mobile, social media and behavioral data collection technology platforms. The company operates in more than 35 countries, from 23 offices around the globe, and is recognized as the quality, scale and customer satisfaction leader in its industry. For more information go to www.researchnow.com. Nest's mission is to create a home that's thoughtful -- one that takes care of itself and the people inside it. The company focuses on simple, beautiful and delightful hardware, software and services. The Nest Learning Thermostat™ and Nest Energy Services keep you comfortable and address home energy consumption. The Nest Protect™ smoke and carbon monoxide alarm helps keep you safe and Nest Safety Rewards lets you save money through participating home insurance providers, while Nest Cam™ keeps an eye on what matters most in your home. Nest products are sold in the U.S., U.K., Canada, France, Belgium, Ireland and the Netherlands and are installed in more than 190 countries. The Nest Learning Thermostat has helped save approximately seven billion kWh of energy to date. Through the Works with Nest program, third-party products can securely connect with Nest devices to make homes safer, more energy efficient, and more aware. For more information, visit www.nest.com.